I’ve been reflecting on the passing of Theodore Bikel who died on July 21, 2015 at age 91. Theo, as his friends called him, was a role model for me. He was an accomplished actor, folk singer, political activist, and Yiddishist who continued to work until the very end of his life. For many years, in performances all over the world, he performed the role of Tevye the dairy man, the main character in Fiddler on the Roof. 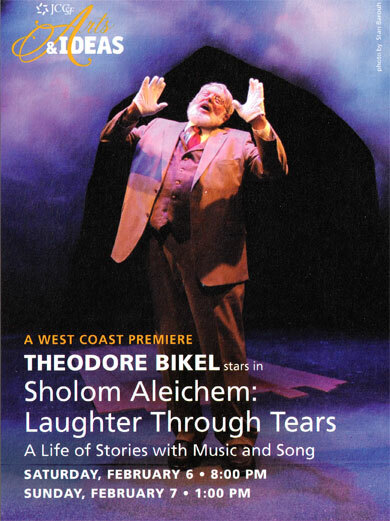 His deep and heart-felt connection to Tevye’s creator, the Yiddish writer Sholem Aleichem, was a central force in Theodore Bikel’s life, and led to his own creation of a one-man show, Sholom Aleichem: Laughter Through Tears. While attending two performances of this production in San Francisco in the winter of 2010, I had the opportunity to—very briefly—meet the actor-singer-playwright backstage following the second show. So I booked a hotel room just a block away from the JCC and off we headed to San Francisco. Because we were traveling all the way from North Carolina, we decided to buy tickets for both the Saturday night and Sunday matinee performances. As a bonus, my sister Robin and her husband Jim flew in from Los Angeles to attend the Saturday show, and Carolyn’s oldest son Steve and his wife Janice, who live outside of San Francisco, joined us on Sunday. 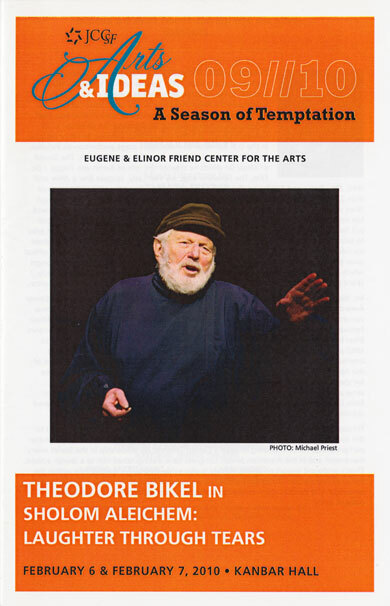 What I remember most about Theodore Bikel’s play and performances—90 minutes without an intermission—was the way he wove together Yiddish songs, the character of Sholem Aleichem the writer, Sholem Aleichem’s stories and shtetl characters, and his own personal reflections on yiddishkayt (Jewishness). With energy and power, Theo carried us through the ascent of Yiddish culture, the sadness of its demise, and the admonition to never forget. When Sunday’s performance was over, I headed to the stage door and stood there like a 14 year old boy from my Mittleshule days—a student steeped in Yiddish culture who dreamed of becoming an actor, musician, and political activist. This is why meeting Theodore Bikel seemed so important: He wasn’t just a Jewish entertainer; he was like a member of the family—a zayde (a grandfather) from our very small, special Yiddish world. And he was using theater and music to keep this world alive. 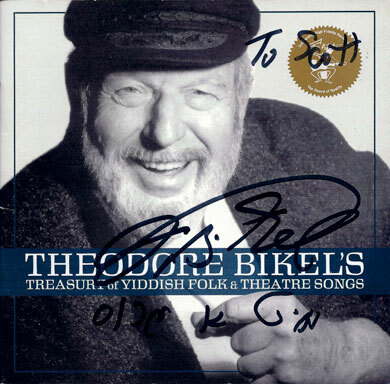 As I stood in line, I pulled out the CD cover I had brought along of Theodore Bikel’s “Treasury of Yiddish Folk and Theatre Songs.” When I was finally invited in, I found him sitting in an overstuffed chair. He was munching on a handful of almonds. His hair and beard were white and he seemed smaller than he had onstage, yet vibrant and alive. He greeted me with kindness, wrote “Mit vareme grusn (with warm regards)” in Yiddish, and signed his name. It was over in a minute, yet the memory will last a lifetime—as all good memories (and stories) should.